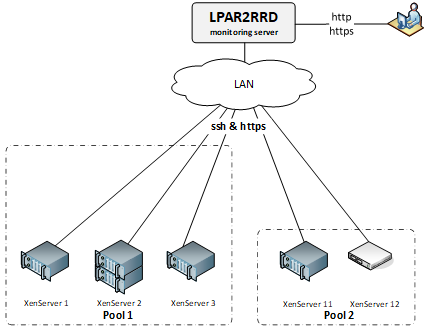 Create user account (preferably lpar2rrd) on each XenServer host. The account should be assigned at least the Read Only role in XenServer's Role Based Access Control (RBAC). If your setup has RBAC configured, create user account lpar2rrd and assign it the Read Only role. If you are using XenServer Free edition or do not have RBAC configured, only root user has necessary privileges. Exchange ssh-keys to all XenServer hosts. Now try logging into the machine, with:   "ssh 'xen-host1'"
All is configured from the UI. $ crontab -l | grep "load_xenserver.sh"
Assure you have a cron jobs for XenServer in place (upgrade script might do it automatically) Skip it on the Virtual Appliance, it is already there.